A section of the delegates and invitees to the opening session of the AFC’s National Conference. The Alliance For Change (AFC) believes it is “outstanding” than the People’s National Congress Reform (PNCR)-dominated A Partnership for National Unity (APNU) in governing Guyana, and lamented that the political pact between the two political organisations is not functioning effectively. “It is fair to say that our ministers have to do date performed well above-average in their respective portfolios and with due respect to everyone, we have been the outstanding party in the coalition government up to this point,” AFC General Secretary, David Patterson said in his report to that party’s National Conference at the Vreed-en-Hoop Primary School. AFC Leader, Khemraj Ramjattan, in his remarks, sounded a more charitable tone while stating that the AFC ministers have performed creditably. “Take the example of the performance of our ministers. And please don’t get me wrong. I do not seek by this to denigrate any of my APNU ministerial colleagues. Our AFC ministers have done well in their respective portfolios and jurisdictions,” he said. In keeping with the Cummingsburg Accord, a Valentine’s Day 2015 pre-election pact between APNU and AFC, the ministers drawn from the now 12-year old party are Prime Minister Moses Nagamootoo; Public Security Minister, Khemraj Ramjattan; Minister of Agriculture, Noel Holder; Minister of Public Infrastructure, David Patterson; Public Telecommunications Minister, Catherine Hughes; Business Minister, Dominic Gaskin and Junior Minister of Indigenous Affairs, Valerie Garrido-Lowe. While the AFC ministers are so far virtually unscathed by any major controversy or allegation, a number of their APNU colleagues have not escaped. They include Minister of State, Joseph Harmon; then Minister of Health, Dr. George Norton and his successor Volda Lawrence. Patterson said “not every element” of the Cummingsburg Accord- whose 36 month life span ends in February 2018- has functioned in keeping with its framers’ intentions, resulting in the need to address a number of issues “to enhance its effectiveness.” The AFC General Secretary said the management of relations between the two political organisations in keeping with the accord has not been entirely satisfactory. “The day-to-day administration of the accord is much less than desirable. The interface between the coalition partners at all levels has not been the best, although at the Cabinet and ministerial level the working relations have been excellent,” he said. Patterson said a stalemate in talks between APNU and AFC on how to overcome a gap in the Cummingsburg Accord on contesting local government elections has resulted in defeat in some areas. “One of the main weaknesses of the accord was the silence on how the coalition would treat with the local government elections. The coalition partners were not able, despite some effort, to reach an equitable political arrangement which led to a less than satisfactory outcome for those elections,” he said. The General Secretary said his party is “fully committed to the coalition” and cautioned against publicly ventilating their concerns “because it becomes fuel for our enemies.” “Let us work with our partners to fix our problems by applying mature leadership and let us resolve any issues we have in a consultative manner rather than a publicly adversarial manner,” he added. Patterson called for more support to improve the AFC’s secretariat, enhance internal and external communication, more focused fieldwork and increase its membership by targeting more youths. Earlier, AFC Leader Ramjattan earlier cautioned party faithful against being antagonistic towards the APNU and reiterated that coalition politics in Guyana is here to stay. While he admitted to some of the AFC’s shortcomings, he expected others must also share the blame. “As General Secretary, I must share some of the weaknesses I identified. However, it is not just a lack of focus or involvement on my part. Other officials and members must resolve to give more time to the party’s work because a strong, functioning effective party machinery is indispensable for positive political fortunes,” he said. 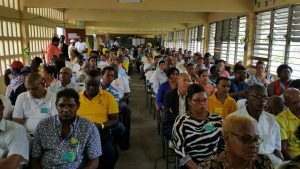 Delegates were Saturday afternoon expected to know the outcome of balloting earlier in the day to elect a Leader, Chairman, Vice Chairman, General Secretary and Treasurer as well as 12 National Executive Committee members. The number of delegates eligible to vote is 274.